Home → Uncategorized → How does your product help Channel Partner sales reps sell their other lines? 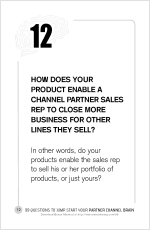 How does your product enable a Channel Partner sales rep to close more business for other lines they sell? “Co-opetition” entered business vocabulary in the mid-1990’s, popularized by a book by the same title. Written by professors Adam M. Brandenburger and Barry J. Nalebuff, Co-opetition is an instruction book for achieving market leadership through the use of game theory. The very best part of the book (aside from the fascinating history of Nintendo’s NES rise to near-monopoly, pp 111-117) is a simple, yet powerful, strategy tool called Value Net. The Value Net diagram shows interlocking, incestuous relationships between customers, suppliers, competitors and complementors. Putting names on the board, organized as described, is incredibly useful. We utilize Value Nets in most of our strategic consulting projects. 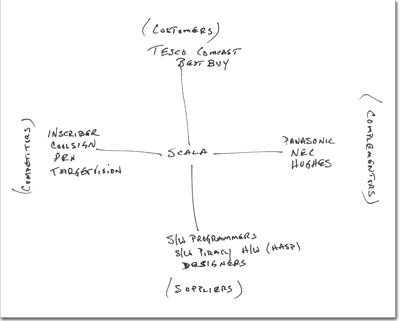 Here’s a simple Value Net I sketched out for Scala, the leading networked digital signage software company (and client). You know those massive video walls at Tesco or Best Buy? Networking and controlling the content on all those screens is what Scala does. In Question 1: What keeps your Channel Partners up at night?, I gave you example of how a less important line can enable sales of other products on the Channel Partner’s line card…and by doing so become a hero. In Co-Opetition-speak, what you really need to understand is your added value (yeah, they coined that term, too). You’re a Complementor if you’re increasing the value of other products on your Channel Partner’s line card. Or, as I like to say, when someone buys your products you’re increasing the likelihood of a sale of the others. In Scala’s case, they grease the skids for the sale of digital monitors and increase the likelihood their VARs can win a package deal (Scala software + monitors) vs. making a solo software sale and losing the digital monitor order to Wal-mart. Where and how do you complement those other products on the line card? It’s a worthy discussion for your channel support team. Start drawing the Value Net for your own business and when you’re ready, map out the Value Net for your Channel Partners.